Because they can’t speak for themselves. 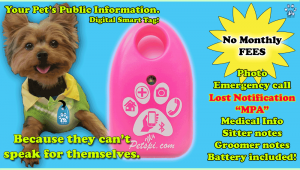 Your pet’s public information tag features. Emergency call center just in case your pet is lost and found. 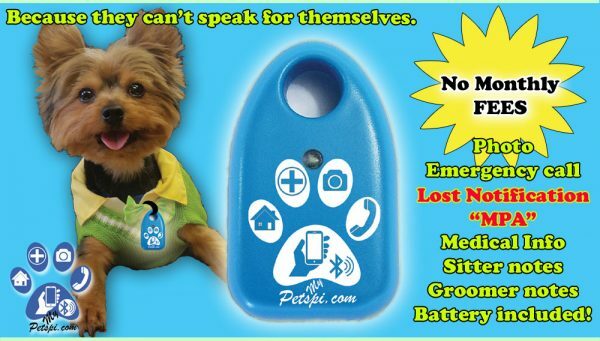 A lost notifications will be sent to anyone within 100 ft of your pet, with a smart phone/w Bluetooth technology. No app required for Android phones. Iphones will need to download the app or scan the QR code on the device with your Iphone. 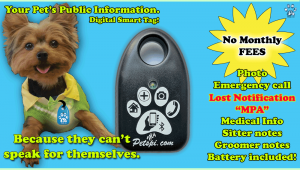 We can send out a “Missing Pet Alert” to all the pets all over the world wearing a PETS P.I tag!. This alert will also signal out to anyone within 100 ft of that pet as well, creating a web of notifications to help find your pet. All the pets working together to keep each other safe and sound. A FREE digital Flyer will be created for missing pets, offering a reward for their return at your request. All of your information can be configured from your smart phone anywhere, anytime. “FREE SETUP” If you need our help! just call us or fill out the tech support form.